SANAE SUZUKI is a Whole Health Macrobiotic Counselor, Flower Essences Practitioner, and Certified Therapeutic Massage Therapist for people and pets. She was diagnosed with ovarian cancer in 1993, which inspired her to learn about macrobiotics as a path to healing. Eight years later, she suffered a near fatal car accident in the Arizona desert. She was able to overcome both of these extreme life challenges through practicing and embracing the philosophy of macrobiotics. She is a long-time student of Michio Kushi, world leader of Macrobiotic education, and completed all Level IV training at the Kushi Institute in Becket, MA. She also holds a certificate of recognition from Kushi Institute International for macrobiotic teaching. Sanae has taught and cooked extensively within California, nationally and internationally, her venues include the Health Classic, A Taste of Health Cruise, the International Macrobiotic Summer Conference, several locations in Japan including Kushi Institute of Japan, and the Caribbean, UK and Europe. It is her desire to help plant a seed of physical, intellectual, and spiritual happiness that will flourish within each person she meets. She has written and published her cookbook, “love, sanae,” which features a full-year’s worth of complete vegan macrobiotic healing recipes and her journey of macrobiotics. She has opened very popular Vegan Macrobiotic cafe, Seed in Venice, California with her husband, Eric Lechasseur who is well known vegan macrobiotic chef for celebrity’s and author of “love, eric” in 2008. She has been offering community classes at Seed by vegan macrobiotic Meetup. 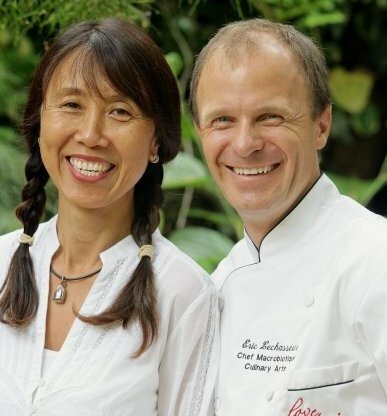 Eric and Sanae have Macrobiotic retreat location in North Fork, California near Yosemite National Park. People can come and just relax and eat good food. Also she just started an eco-green macrobiotic studio “mugen” in Santa Monica, California where she offers classes and events and also people can come and stay overnight.